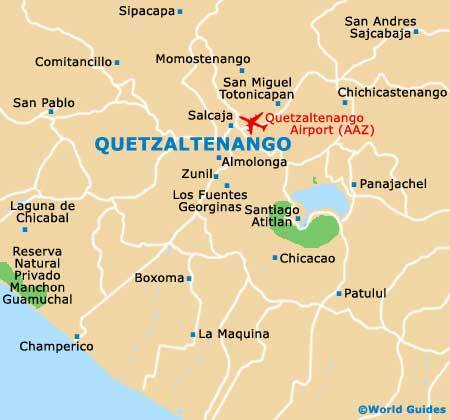 Shopping in Quetzaltenango is geared towards the needs of the local people. The city doesn't contain a great number of upscale boutiques and only two mall-style outlets. Souvenir shopping is more rewarding, with small shops in the cobbled streets of the Old Quarter and clustered around the Parque Centro, particularly along the Pasaje Enriquez. Quetzaltenango is a great place for street markets, and although they are mostly given over to household goods and fresh foods, a few Mayan craft stalls will always be found. The presence of the university and the many Spanish language schools attracting foreigners has given rise to a good choice of secondhand bookshops, which can be interesting to explore. Mayan crafts are the main souvenirs here, and the best of them are the beautifully woven traditional textiles, which come in all forms from hammocks and blankets to bags, clothes and household items. The rich and flavourful locally grown coffee is a must-buy in Quetzaltenango. Jade and silver jewellery are also popular buys, and traditional pottery and wood carvings look good in the modern home. The two American-style shopping malls, Hiper Piaz and La Pradera, are located towards the edges of Quetzaltenango, with regular dedicated buses for determined shoppers. Both have supermarkets in addition to the usual franchised stores and fast-food outlets. For the finest textiles and a contribution to local enterprise, La Trama is a women's weaving co-operative which trains, supports and pays fair wages to local workers. Their bags, scarves and other textile offerings are top quality and La Trama is conveniently located just one block north of the Parque Centro America. The Friday San Francisco el Alto Market is the best and most authentic in Quetzaltenango for any kind of craftwork or souvenir shopping, and is definitely not a tourist trap. La Democracia Market is ten blocks north of the Parque Centro and sells anything and everything from snacks and socks to soap and much more. Other street markets take place regularly at La Demo, Minerva (near the bus station) and Las Flores. The Centro Comercial is the area around the Parque Centro, coming stuffed with little souvenir and craft shops providing quality at a reasonable price.